I recently embarked on a restoration project on an old Unisaw. Like a lot of folks working out of the garage, the mobile base is a requierment. I looked around at many of the bases on the market and was turned off by the cost of most of them. I had a hard time justifying $150 or more for one of these, regardless of how bad the need was. I finally settled on the HTC3000 heavy duty base that was rated at 700lbs. The Unisaw is a big heavy cabinet saw weighing in the neighborhood of 500lbs, so I got the strongest one they had. When I put the base on the saw, I noticed the bars that connect the corners are mild steel straps, so I knew they would bend relatively easy. 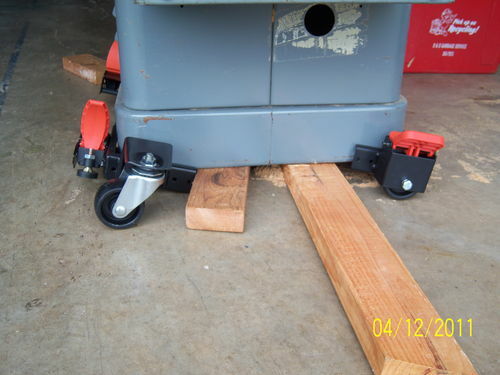 With the full weight of the saw on the wheels, the front caster mounts do flex, and it gives a bit of a bouncing movement when I pull the saw across the garage floor. The retractable feet lock down and release with no issues. The levers are a hard plastic that I’ve heard many complaints about. To be sure, these levers are not going to break under normal usage. They are actually made pretty well. The problem I have is the flex that the caster mounts have. Had I designed the base, I would have made them much stronger, to inspire the confidence that I’d like to have when pulling up to 700lbs of saw around without it bouncing around. The base assembled pretty easy, once I realized that the instructions are dead wrong when they tell you to get out a bunch of standard size wrenches: 7/16, 1/2 and so on. I found quickly that everything on this base is metric. They LIE!!! Other than those issues, I’m happy with the base. I can move my saw to the center of my garage when I’m using it, and push it back to it’s parking spot when I’m done. 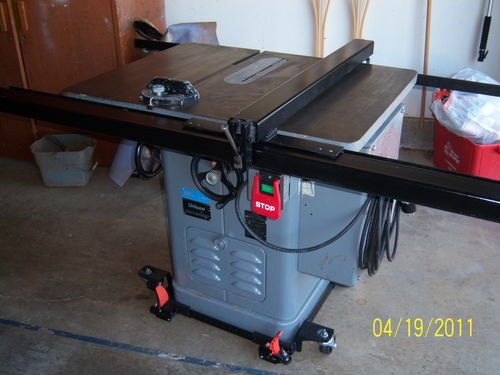 I need to get one for my jointer now. Thanks Wayne, I really wondered how that base worked. Needing on for a new planer, but think I may just build a planer stand with some good casters. Nice Saw! Note for anyone else that gets one of these: I had a small problem with the side casters not fitting properly (specifically the wheel bushing wasn’t fitting in), figured out that if I took the rail bolt off, fit the little caster holder thingy in place and then put back in the rail bolt it was all good. Basically the holes were ~1/16-1/32 off. Agreed on it looking light for a “700lb” base (maybe 400 would be solid), I have it under a floor DP (appropriately set wide with a 3 layer plywood base) and imho its plenty study for that, for something heavier I’d have more qualms. One of the problems I had with it, you just reminded me, was on the straight wheel where the bolt goes through the bushing through the wheel and then is supposed to thread into the other side. Either the bolt is a little too short or the metal wheel mount box thingy is a little too wide. I couldn’t get the threads started on either side. I had to take the wheel out, thread the bolt and squish it together a bit, then put the wheel and bushing back in (which was not easy) and then the bolt would start.